Road users are being advised of road closures on the M6, A14 and M1 near Catthorpe this Saturday (21 March) as part of the M1 junction 19 improvement scheme. The A14 to M6 westbound link road will be closed between 8pm on Saturday (21 March) and 2pm on Sunday (22 March). The M6 carriageway will be closed between the M6 junction 1 and the M1 junction 19 in both directions between 9pm on Saturday (21 March) and 8am the following morning (Sunday 22 March). The northbound on slip at M1 Junction 18 will also be closed from 9pm on Saturday (21 March) for approximately four hours. The closures are necessary for the removal of a redundant bridge. The work can only take place safely and quickly if the road is closed. We are carrying out this necessary work overnight at the weekend to minimise disruption to road users. During the closures, diversion routes will be in place and clearly signed. Road users are advised to plan their journeys, leaving extra time. Once this scheme is completed, the new link road underneath the M1 will link the M6 directly with the A14, helping the flow of traffic and reducing congestion at the busy Catthorpe junction. I would like to thank road users for their patience while we deliver this important junction improvement. When the northbound slip at the M1 junction 18 is closed, traffic wishing to head north on the M1 will be diverted onto the A5 to the roundabout with the A4303 and turn right onto the A4303 to join the M1 at junction 20. M6 bound traffic will be directed left at the A5 roundabout with the A426 to join the M6 at junction 1. 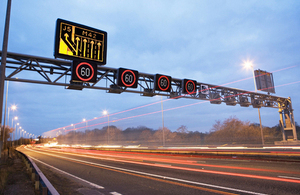 Further information on the M1 junction 19 improvement project is available on the Highways Agency’s website.